four common ways that muscles cause pain. When a muscle is injured or overloaded it may develop myofascial trigger points. 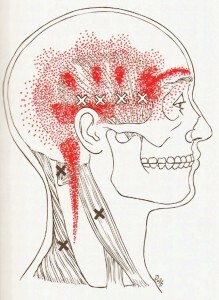 Trigger points are hyperirritable spots within taut bands of muscle that refer pain to other locations in predictable patterns. This means that trigger points in your shoulder or jaw muscles might be causing the pain you feel in your temple! Locating the source of the pain can be a bit of detective work. However, your massage therapist can help find the trigger points that may be causing you pain. She also has a number of skills for releasing trigger points and freeing you from pain. Of course, if the trigger point is caused by poor posture, bad ergonomics or inefficient sporting technique then this will need to be addressed as well. Occasionally, trigger points can be caused by nutritional deficiencies or medical problems. Your massage therapist is trained to recognize when referral to another Health Care Professional is required. Muscles which are exercised beyond their limits become sore for a day or two afterwards. This is a natural process for athletes in training. With adequate rest and nutrition, the muscle becomes stronger. However, post-exercise soreness is common in many of us who are not athletes! If poor posture tends to overload your neck, shoulder or back muscles then it is likely that you will regularly experience post-exercise muscle soreness. The difference between you and the athlete is that the athlete overloads their muscles for only an hour or two. Then they rest. Poor posture overloads muscles for hours at a time, day after day. As a result of the lack of rest, the muscles don’t get stronger; they get sore! This type of soreness is also common for people recovering from a motor vehicle accident. Physical trauma causes pain, which is worsened with movement. As a result many people move less causing their muscles to become deconditioned and chronically sore from fatigue. Massage helps to relieve post-exercise muscle soreness. However, if the soreness is chronic due to poor posture, then you need to improve your posture. This can be done through stretching, strengthening and improved body awareness. If the soreness is due to deconditioning, then you will have to build up the strength in your muscles again. This involves overloading the muscles with some kind of resistance such as weights, elastic tubing or maybe an aquafit class, followed by adequate rest and nutrition to allow the muscles to become stronger. In either situation, your massage therapist can help you with massage, problem-solving around your body use patterns and/or referral to an appropriate professional. Muscles become torn or strained by excessive forces during motor vehicle accidents, sports injuries or simply during a misplaced step or movement. Muscle strain involves tearing of muscle tissue and, depending on the severity of the injury, a certain amount of bleeding within the muscle. Strain affects the muscle that has been injured as well as neighboring muscles and joints. While complete muscle strains must be repaired surgically, most strains heal well. It is vital that muscle injuries are managed well. In recent injuries the muscle must be protect from further injury and that inflammation is minimized through the application of cold or ice. As the muscle recovers it is important to gradually introduce full movement to the muscle. Over the long haul, injured muscles are usually weaker. This weakness can then give rise to post-exercise soreness during day-to-day activities. This makes it important to strengthen strained muscles at some point in their healing. Massage therapy can be helpful throughout all the stages of recovery from muscle strain. Muscles go into spasm when they are injured; when they are protecting the body from further injury (such as when a joint has been sprained); and occasionally when there is referred pain from disease. Muscles can also go into spasm when they are contracted from a shortened position. A common example is when you are pointing your toes and your calf muscle cramps. When this occurs, you must gently, but firmly stretch the muscle. 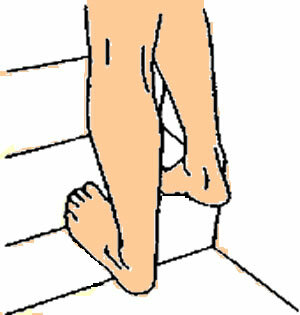 With a calf cramp this is done by slowly placing more weight on the ball of the foot in a supported standing position until the muscle gradually releases. Muscle spasm may also be treated with gentle massage, however the cause of the spasm may need to be found and treated. The soreness that is left after a spasm has been released is often well treated with massage therapy. This information is not intended as medical advice. It is not a substitute for any type of treatment that may be prescribed by a physician. All responsibility for liability, injury, risk or loss related to the use of this material is assumed by the person using this material.